I cannot think of an easier treat to make for the holidays. This is delicious and oh so simple! 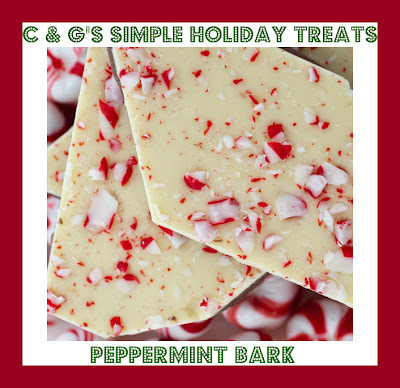 It takes two ingredients: a 12 ounce bag of white chocolate chips (I use Ghiradelli) and 6 crushed candy canes. I make several different barks each Christmas and this one always goes quickly. Simply melt the white chocolate. I do this in a mixing bowl sitting atop a pan of slowly boiling water to create a double boiler effect. While it's melting, crush your candy canes. You can do it in a Ziploc bag with a hammer or do what I do and just break up bigger pieces and place in a mini chopper and chop quickly that way. When the chocolate has melted, fold in the candy cane pieces. Using a rubber spatula, spread onto a layer of waxed paper. Chill for an hour or so and then break apart. Voila!